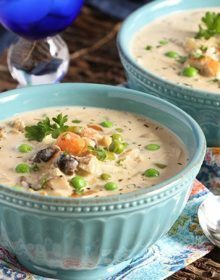 A Cheesecake Factory copycat, this Creamy Chicken Soup is loaded with veggies. Light on calories, huge on flavor! In a large pot or dutch oven, heat the oil over medium heat. Add the onions, celery and carrots. Cook until softened. Stir in the mushrooms. Cook until soft and most of the liquid has evaporated. Add the garlic and cook for 1 minute. Stir in the thyme and cornstarch, continuing to cook for another minute. Add the artichokes, peas and chicken to the pot. Cook for 1-2 minutes. Stir in the onion powder and chicken stock. Bring the soup to a boil and then turn the heat down to a simmer. Cook the soup until it begins to thicken, approximately 4-5 minutes. Stir in the half and half. Cook for another 2 minutes. Season with salt and pepper. Serve immediately sprinkled with parsley, if desired.